Who ya gonna call? GHOSTBUSTERS! <cue music> Just in time for its 25th anniversary, the cult classic Ghostbusters arrives on Blu-ray that has been digitally remastered and once again returns us to a simpler time of man versus ghosts. For Generation Y, the story revolves around a group of parapsychologists who lose a university research grant due to the "bogus" nature of their methodology. Ghosts? Come now... who believes in Ghosts? Needless to say equipment that actually tests for ghosts! Broke and almost destitute, Dr. Peter Venkman (Bill Murray), Dr. Raymond Stanz (Dan Aykroyd) and Dr. Egon Spengler (Harold Ramis) decide to go into business themselves by opening up a "Ghostbusters" service. With state of the art technology and gags to boot, this trio becomes quite popular within the city of Manhattan. As they make a name for themselves in the city, they soon start cleaning up the streets, however something causes Spengler and Stanz to question the large amount of ghosts. Eventually, they discover that the fate of the world is in their hands when they are called to investigate a strange occurrence at the beautiful home of Dana Barrett (Sigourney Weaver). Through investigation, they ascertain that her building is in actual fact a portal to another realm and if not closed, the very existence of man is at stake. The comedy comes into play when the trio discover that in actual fact, it's the fridge of Dana that is causing these problems. Masterfully directed by Ivan Reitman, Ghostbusters was a true cinematic classic that although spawned a mediocre sequel, fans were clamoring for more and unfortunately it never came. However! Fans of Ghostbusters can now play the official next installment of the trilogy in the Ghostbusters the video game, a PlayStation 3 exclusive that takes the series to the next level and best of all, it features the original actors and even the original writers of the film. Back to the blu-ray, in relation to the movie, it was written by Dan Aykroyd who brought together a star studded cast of the time with funny man Bill Murray leading the charge. The movie contained a healthy amount of humour, action and even a few scares from the special effects of the time plus a forced romance by lady's man Venkman with the possessed Dana. Apart from the three main "tenors" in the movie, it also starred some strong performances by Rick Moranis as Louis, Ernie Hudson as Winston and Annie Potts as Janine who add a human and sometimes hilarious seriousness to the movie. Although the blu-ray version has been remastered, it's great that Sony did not touch the special effects as the corniness of these bad 80's special effects only makes the movie even more endearing. Of course, who can forget Slimer as the unofficial mascot of the Ghostbusters, a friendly green ghost and that famous car, Ecto-1 with its annoying siren. Yes... these were a simpler time that thankfully did not take itself serious and as a result, creating a truly entertaining movie. On Blu-ray, Sony have created a wonderful Ghostbusters experience with outstanding video (1080p) and audio quality (Dolby TrueHD 5.1) that almost makes it look like the movie was filmed yesterday. As soon as you put the Blu-ray disc, the famed theme song starts to play as snippets from the film play in the background. Apart from the main theme, the disc features commentary with Ivan Reitman, Harold Ramis and Joe Medjuck who give a true insight into this 80's phenomena. 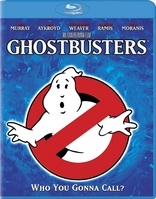 Add in a variety of other entertaining tidbits from a plethora of featurettes to interviews with the cast and crew and this truly is the definitive version of Ghostbusters. SLIMER MODE: Picture-in-Picture Graphical Viewing Experience with an examination of the spook-hunters' firehouse headquarters, an in-depth exploration of the creatures in the Ghostbusters mythology, behind-the-scenes discussions of making the movie, new cast, crew and special effects artists interviews and much more! In conclusion, Ghostbusters on Blu-ray is a must have for fans or lovers of classic Hollywood movies. Brilliantly digitally remastered with a plethora of special effects, this movie only gets better by age. A must have blu-ray!